We don’t just talk the talk. We walk the walk! There’s no substitute for first-hand experience when planning a set of walking routes. Planning from online maps and satellite photos is all very well, but to get a real sense of a route you simply have to walk it. We pound the pavements, tread the towpaths and delve into dead-ends, all in the interests of finding the optimal routes available. 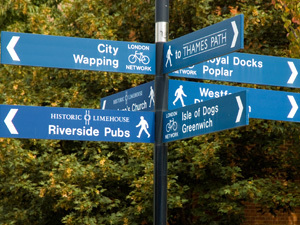 As local walking experts, we were asked by the Tower Hamlets active travel team to support Walk England in the route planning for a new series of Tower Hamlets walking maps. Organised by neighbourhood, each of the eight maps provides between three and five suggested routes. They include plenty of green space and waterside walking, and many of the routes were designed to pass by the doorsteps of local health centres, where the printed maps will be distributed. We like to take a rounded approach when planning our routes, taking into account the physical environment, its suitability for the group and a pragmatic risk assessment to minimise the chance of accidents. But always, on any project, we ask ourselves why somebody would want to walk the route in the first place. Walks work best when they are part of an engaging and accessible package, offering a sense of discovery, wellbeing and community.